Milan authorities have decided to ban cars and motorcycles for three days next week in an attempt to curb the city’s smog problem. Drivers in the northern Italian city will have to leave their vehicles at home between 10AM and 4PM, beginning on December 28. Authorities have introduced a special “anti-smog” all-day public transport ticket for €1.50 ($1.65). Milan Mayor Giuliano Pisapia appealed to all the city’s municipalities to observe the three-day ban. The administration of the Lombardy region, of which Milan is the capital, also appealed to local officials to cancel traditional firework displays to prevent conditions worsening. 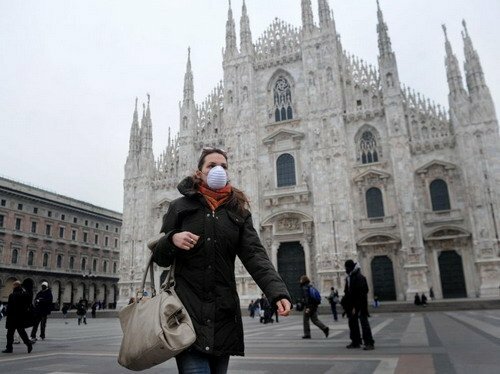 Milan was named as Europe’s most polluted city in 2008 and it remains among the worst on the continent. City officials have limited traffic on several occasions in the past, first trying out a ban in 2007. Rome has also limited traffic on several occasions. Two major Spanish cities have also imposed measures to reduce pollution. A 90km/h (56mph) speed limit was introduced in the Barcelona area last week and parking for most vehicles has twice been banned from the centre of Madrid since last month. Along with the iconic Vespa scooters, another Italian staple looked under threat in parts of the country earlier this week, when the mayor of San Vitaliano, just outside Naples, banned the use of wood-fired pizza stoves. Under the edict, the stoves need to be fitted with special pollution filters before they are allowed back into action. China’s capital Beijing has introduced similar restrictions in recent days after some of the worst smog in the city’s history. Beijing last week declared a red pollution alert – the most severe of its kind – for the second time this month. The restrictions in Beijing mean cars can only be driven on alternate days, depending on whether their number plates end in an odd or even number. Statistics show that about 112,800 vehicles violated the rule in just four days, according to Beijing News.